That humanity has a common heart, is a truth generally recognized, but not always remembered in the actual relationships of man with man. A soul in distress, be it from a sense of sin, or from losses and disappointments, speaks a language which every other soul in distress perfectly understands. The feelings of the heart are the same, under the same conditions. When men try to express those common feelings in literary form, of necessity that form varies, but the substance remains the same. The best definition of the word "prayer," ever proposed, is found in the verse "Prayer is the heart's sincere desire, uttered or unexpressed." And it might be added that the "uttered" desire may be expressed in uncouth language, with superstitious conceptions, with irrational philosophy or with wild imaginings, but the heart's sincere desire may remain the same. This should not be forgotten in the actual relationships of man with man. The form of prayers may widely differ, but the eye of understanding must pierce these outer forms, and see the heart in its "sincere desire." The Poet-saints of Maharashtra were all Vedantists in philosophy. Almost without exception they belonged to the bhakti school of thought. 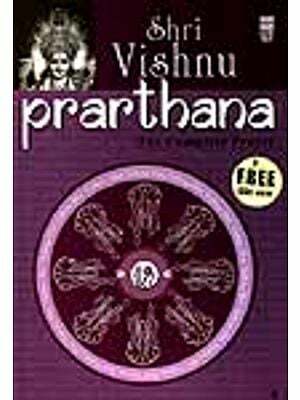 The Vedas, the Upanishads, the great epics of the Mahabharata, and the Ramayana, and the eighteen Purans, were to them sacred books, divinely inspired, and necessarily their metaphysical, and moral philosophy, and their stories of the deeds of gods and heroes, were accepted as undeniable truths. 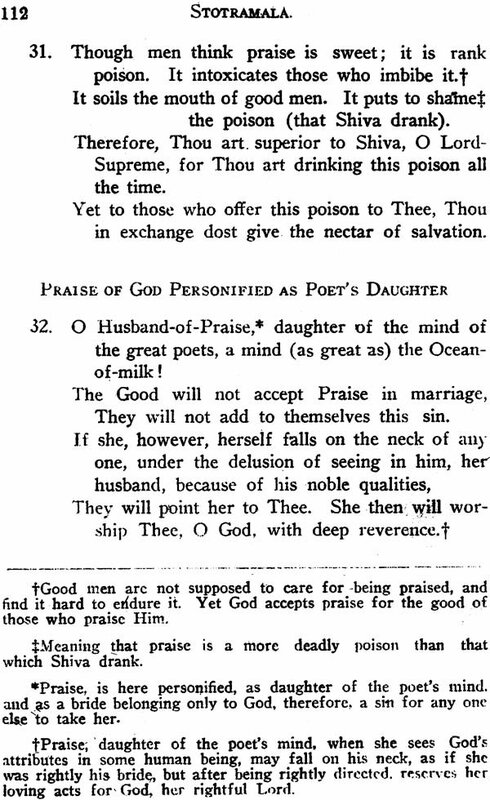 In their prayers, therefore, there are many things that must appear strange to those who have a different philosophy to those to whom the Puranic stories mean nothing but curious legends, and to those to whom even the moral implications contained in these prayers, seem at times at variance with the standard of morals, that the modern heart and conscience demand. Readers of these prayers may, therefore, do their authors an injustice by concentrating their attention on the form in which the prayers appear, instead of on the inner kernel of those prayers, the 'heart's sincere desire." 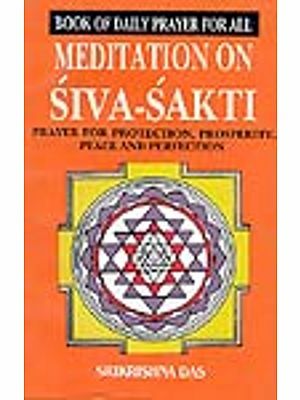 In the writings of the Maratha poet-saints, those of a devotional character, such as might be called prayers, are not always prominent. And yet such was the devotional character of the authors themselves, that somewhere in their writings prayers are to be found. I have begun the collection of prayers, or rather "Garland of Prayers," following India's poetic designation, with two prayers of Dnyanadev, which are the beginnings of two of the chapters in his Commentary on the Bhagavadgita. This Commentary is a remarkable book. It was written, as generally accepted, in the year 1290. It was the first attempt to give to those ignorant of Sanskrit, a knowledge of the contents of the Bhagavadgita, and Dnyanadev's high motive frequently appears throughout the book. Every chapter begins with an invocation, that might be considered a prayer, but the two that I have selected seemed most appropriate for this "Garland of Prayers." The Benediction with which he closes his book, is a beautiful prayer, making a worthy closing to any book designed to meet human needs. His Benediction, therefore, closes this "Garland of Prayers." I have given Mahipati the last place in the "Garland" for those after him are accounted among modern Marathi writers, and my translations are intended to be from the poetic writings of the older writers. I claim no special logical principle in my choice of specimens of prayers of the poet-saints from Dynanadev to Mahipati. As I turned over the pages of their books, my eyes caught some striking passage in a prayer, and when read more carefully, it was accepted for the "Garland" if it had the form of a prayer expressing some deep desire on the author's part, for himself or others. 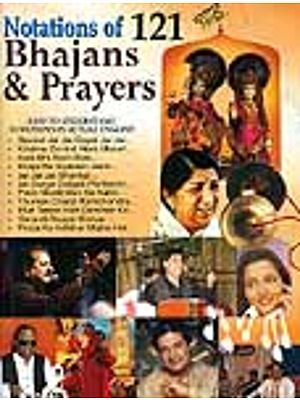 The three long prayers, the Vyankatesha Stotra by Devadas, the Kekavali by Moropant, and the Pandurang Stotra by Mahipati, are very popular in the Maratha country, and I could not omit them from the "Garland of Prayers," The authors are arranged chronologically so far as the vexed question of dates permits. Many books on Comparative Religions have been written by scholars. Hinduism has been represented by many worthy Sanskrit students. They have drawn their information from Sanskrit students. They have drawn their information from Sanskrit books. But it is a fact that Sanskrit devotional books are so rare, that they have not attracted the attention of a single writer on Comparative Religions. In these books therefore, comparing Hinduism with other religions, it is the philosophy and ritual that is compared, and not the deeper depths of the soul's feelings, cravings, longings, hopes, confessions of sin, loves and hates, aspirations, sense of dependence on God, cries for help, such as may come from the depths of a Hindu's heart in sorrow and distress. 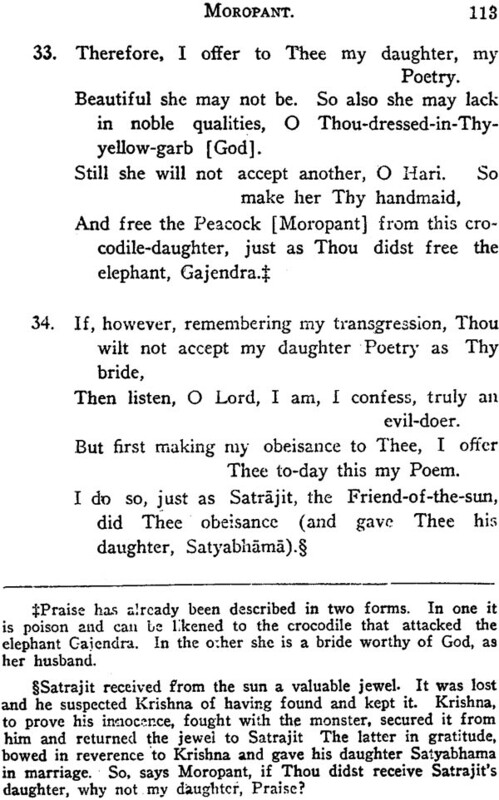 Such things are not to be found in Sanskrit books so far as I know. They can only be known, therefore, through the Indian vernaculars. I am not aware that America, England, nor the Continent of Europe has produced a single scholar who can read with fluency the old Marathi literature, one of the store houses of these deeper feelings. All books, therefore, on Comparative Religions, dealing with Hinduism, are, I am convinced, deplorably defective. 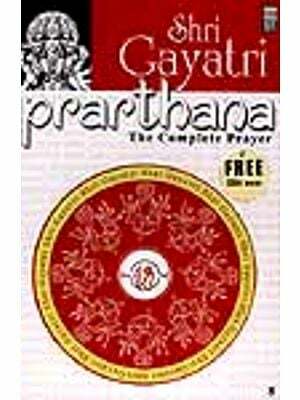 The translations of the prayers in this "Garland", while very incomplete, so far as extent is concerned, will I trust, be found to cover so many aspects of a Hindu's heart's desire as to throw light on many of their deeper feelings, and so help to a better understanding of the Hindu heart. Misunderstanding of one another is one of the saddest things in human relationships. If therefore, this "Garland of Prayers" helps to a better understanding of Hindu hearts, this labour of love for India and her people will have its reward. My Indian friends will, I know, easily pardon personal references. The manuscript of this book, I have completed this day, the 25th of December 1928. It is my 75th birthday. On Christmas Day in 1853 I came, I know now whence, into this world. My Hindu friends may perhaps picture for me some other birth, through which I have passed. I will not quarrel with them, but I know not whence I came. To speak the truth, that question of origin interests me very little, but the life of these 75 years has an interest that grows more intense as the natural limit of life approaches. I have many questions to ask myself. What have I done during these 75 years? What part have I had in making this a better and a happier world? What opportunities have I lost? What errors have disqualified me from a larger share in the world's betterment? As India has been the scene of the greater part of my life's activities, have I contributed to making India more truly known, loved and honoured by the rest of the world? Have the needs and the sufferings of so many appealed as they should to my own heart? The true answer to these questions belongs to the conscience in its deepest and most secret recesses, and are not for the public gaze. But as I approach the years of utmost uncertainty, and know full well that few live beyond the age of 75, I want to make a gift to India on this Christmas Day. I give this book, this "Garland of Prayers" to the land and the people I love. It is a small gift, but India has some beautiful stories of small gifts given, and accepted in the generous spirit that made them great. The handful of rice of poor Sudama and his wife, given to Krishna out of love, is the beautiful picture of ideal gifts and ideal receiving of gifts. The literary history of India of the nineteenth century is fascinating with scholars from America, England, France, Italy and other countries visiting our country and becoming eminent scholars of our languages, Sanskrit, Marathi, Bengali, Hindi, Tamil, Telugu, Malayalam, Kannada and the rest. Their advent was of historic interest, and Indian languages and culture benefited remarkably as a result. Reverend Justin E. Abbott belongs to his magnificent galaxy of scholars. He was born in America in the town of Portsmuth in Hampshire in 1853, and he passed away on June 19, 1932. He was four years old when his parents visited Rahunni in Ahmednagar District of Maharashtra. Years later he came to India as a member of the American Marathi Mission. A scholar and preacher of the literature of the Saints of Maharashtra, Abbott lived in India with his wife for forty years. He was the editor of JNANODAYA, the English section of the American Missions' Journal, for 25 years. He retired from the Mission in 1910 and settled at Summitt in New Jersey, studying the life and writings of the Marathi saints. Abbott returned to India ten years later in 1920 accompanied by his wife, on a pilgrimage to places revered by the Marathi saints. He spent a month in Pune at the Bharat Itihas Samshodhak Mandal engaged in research, studying the manuscripts of the saints. Later he visited with his wife Daulatabad and other places, particularly the hallowed placed where Eknath and his Guru Janardana Swamy lived. Mrs. Abbott was presently taken ill, and she expired at the Miraj hospital on June 26, 1921. Abbott returned to America thereafter and attended to the work of the American Oriental Society. He visited various Universities in Europe, looking for further information on the literature of the Marathi saints about whom he had already a rich treasure. Besides, he collected valuable information on Shivaji from the correspondence found in the voluminous "Das Register" belonging to the Dutch East India Company. He passed on the material that he gathered to the Bharat Itihas Samshodhak Mandal. His essay on the coins of Shivaji, published by the Asiatic Society, reveals his high regard for the history of Maharashtra. Abbott wrote a series of articles in JNANODAYA in 1920. Mrs. Abbott was equally fascinated by the literature of the Marathi Saints, which her husband decided to translated into English for the benefit of readers not knowing Marathi. This great work came to be known as "Poet-Saints of Maharashtra" published in a series of volumes. He was hesitant at first to undertake the work, but he was persuaded by his wife and Rev. Edwards of the Theological College of Western India, Pune. Abbott appointed the Marathi Pandit N. R. Godbole to assist him in this task of translation. The actual publication of the work rested with Rev. Edwards who saw it through. This great work on the Poet-Saints of Maharashtra, undertaken and completed by Abbott, placed the people of Maharashtra and India under a deep debt of gratitude to him. "The Poet-Saints of Maharashtra" consisted of twelve volumes: 1. Bhanudas, 2. Eknath, 3. Bhikshugita, 4. Dasopant Digambar, 5. Bahinabai, 6. Stotramala, 7. Tukaram, 8. Ramdas, 9. Bhaktavijay Vol. I, 10. Bhaktavajay Vol. II, 11. Bhaktaleelamrit, 12. Jnaneshwar. These volumes contain Abbott's English translation with notes, life-sketches, glossaries and the English meaning of certain Marathi words, besides the Marathi text, Abbott was acquainted with the literature of the Saints of Maharashtra but he did not realise the importance of the Marathi language until he was back in India, and studied the literature once again and came to the conclusion that this body of writing contained the literature of the highest order and supreme message. Abbott being should be lifted high exemplifying the essence of real Dharma. Nor did he ever lose his faith in Christ and Christianity. He was of the opinion that Westerners never understood the Hindu way of Bhakti. He was sorry that he did not realise earlier the Hindu philosophy. He realised that the Hindus had faith in the supreme God though they might worship various idols. 1. Servants of India Society, Pune. 2. American Mission Hospital, Wai. 5. Gokhale Hall Library, Pune. 6. Social Service League, Bombay. 8. Depressed Classes Mission, Mangalore. 12. Overlook Hospital, Summitt, USA. 14. Rev. Edwards for Poet saints series. 15. American Marathi Mission Naghade Bombay. The greatness of Abbott and his dedicated service are evident from the foregoing information obtained mostly from the late D. V. Potdar's Arvachina Charitra Kosa.